Update 02/09: We got a first look at the alleged P20 (or P11) Lite in some leaked renders yesterday, but today we might have encountered the real thing. In a leak from Spanish language website ComputerHoy (via GizMochina), photos have emerged that are believed to show off the aforementioned device – take a look at them below. Some of the images appear to have been cut onto a different background, but this occasionally happens to help preserve the identity of the person(s) who leaked them. Whether these photos are the real deal or not, they do share a lot in common with the device in the recent CAD render video, including the vertically-mounted rear-camera and display notch. Check out the rest of the pictures at ComputerHoy and find out what else we’ve heard about the device below. Huawei is gearing up for a major launch event on March 23rd where it’s looking increasingly likely we’ll see the debut of the first-ever smartphone to sport a tri-sensor main camera. The P10 and P10 Plus successors seemingly aren’t the only devices on the way from the Chinese giant, however. Just yesterday evidence emerged that a cheaper variant will launch alongside the two flagships that is in all likelihood a replacement for last year’s P10 Lite. 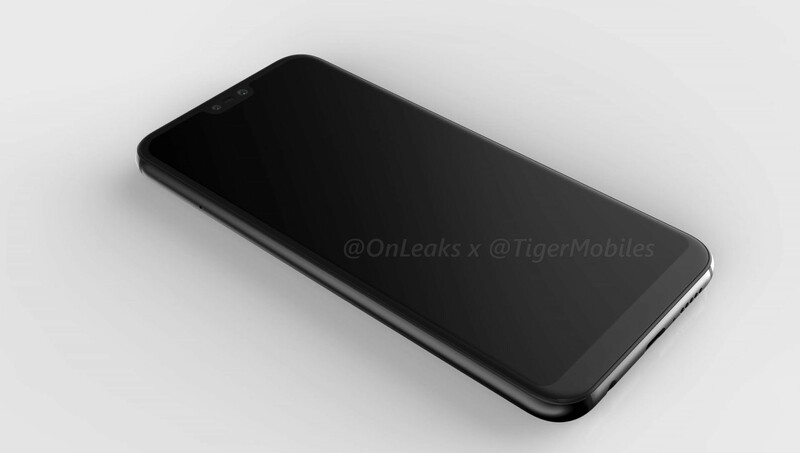 Now, this third phone – allegedly dubbed the P20 Lite or P11 Lite – has popped up again, this time in a leaked render via TigerMobiles and renowned tipster Onleaks. The render all-but-confirms that the P20 Lite will carry a striking resemblance to the iPhone X. The most obvious similarity is the notch embedded into the display which appears to house a front-facing dual-camera. It even borrows the protruding vertical dual-camera arrangement from Apple’s ultra-premium flagship. The display itself is one of the main talking points surrounding the phone. As expected, Huawei has apparently opted for a FullView display surrounded by minimal bezels, but the dimensions listed in the FCC documents suggest we’re looking at a 19:9 aspect ratio rather than the traditional 18:9 experience. Unfortunately, the notch and rounded overall design makes it difficult to pin down an accurate diagonal size. So far we’ve seen estimates from 5.7-inches all the way up to 6-inches, as well as a mooted resolution of 2,280 x 1,080. The render also shows off the P20 Lite’s rear fingerprint sensor, which is now circular rather than the square design found on the P10 Lite, a 3.5mm headphone jack, and what looks to be a USB-C port. As with any unofficial information, it’s best to take all of this information with a pinch of salt. Little else is known about the P20 Lite, but there are plenty of rumblings going around about its siblings, the P20 and P20 Plus. You can read all the rumors for the latter two devices here ahead of Huawei’s event in Paris. What do you think of the P20 Lite? Let us know in the comments.